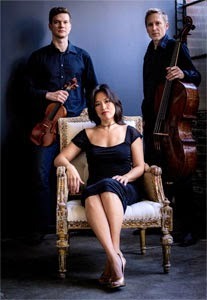 Maybeck Studio: BELLA Trio and Friends: Schubert and Beethoven for Breast Cancer! BELLA Trio and Friends: Schubert and Beethoven for Breast Cancer! How about Beethoven’s “Ghost” Trio? Well, then join us for an intimate, live performance of these masterworks at Berkeley’s acoustically dramatic Maybeck Studio for Performing Arts. Mingle and meet the Artists – Nate, Eric and Mimi, members of BELLA Piano Trio and their esteemed friends, Bay Area bassist Michel Taddei and violist, Marcel Gemperli. Chat with them about your favorite chamber works and what music means to you. Suggested donation $75, online or at the door. All donations are tax-deductible through the SF Friends of Chamber Music. And, as part of their goal as responsible artists, BELLA will donate a portion of your donations to local Bay Area breast cancer support organizations. October is Breast Cancer Awareness Month. Pianist Mimi Lee is a survivor and champion of spreading support and inspiration for all those who have experienced it themselves or through a loved one. BELLA is committed to its role as responsible artistic members of our community. BELLA’s MISSION is to inspire connections through live professional music performances of the highest standards, reflecting shared human experiences and emotions. We are devoted to motivate people to recognize and cherish the beauty in themselves and others. This journey brings us all along a collection of parallel paths, including engaging lecture - performances in traditional and nontraditional concert venues, intimate and social House Concerts, Happy Hour Concerts for the busy professionals, outreach community events and collaborations, and interactive sharing and learning through our website, links and social platforms. All three artists share a deep sensitivity to the value and potential beauty of living artfully and the power of bringing inspirational music to the lives of others. It is this thread that ties them to their music, their audiences, and each other. BELLA was founded in 2010. The members hold degrees from Juilliard, Yale, Harvard, and the Indiana Jacobs School of Music. The trio has participated as Artist Residents of the Banff Chamber Music Program. and were Semi-Finalists of the 2012 Concert Artist Guild Competition. BELLA was also chosen as a Showcase Ensemble for the 2013 Chamber Music America National Conference in New York City. BELLA is a Steinway Artist Ensemble and a proud Affiliate of the San Francisco Friends of Chamber Music (SFFCM), a non-profit organization promoting chamber music of all genres in the Bay Area.